Returning to the North East for this year’s Manufacturing & Engineering exhibition, igus will be at the Metro Radio Arena, Newcastle, on 5th and 6th July 2017. Visitors to the igus stand will see a wide range of cost-effective, lightweight and maintenance-free bearings and cable management systems for a variety of applications. Predictive maintenance is the cornerstone of Industry 4.0 and the factory of tomorrow – igus’ smart plastics warn of potential failure in good time before unplanned and very costly down-times occur. At the event, igus will be showing new and improved smart plastics products. These include, the isense EC.RC, a new system for monitoring e-chains, the optimised CF.Q module for the intelligent chainflex cables that customers are already using today and the intelligent iglidur PRT slewing ring bearings. Injection-moulded, 3D-printed or machined from bar stock, igus offers engineers a wide range of possibilities to obtain their self-lubricating parts, such as gears or plain bearings quickly and cost-effectively. During the show igus will introduce a new process for the production of 3D printed injection mould tools that allows engineers to solve difficult technical challenges quickly. The range of 50 iglidur high-performance plastics are available using this new process, including specialists for high load, food contact, underwater or high temperature applications. Depending on the iglidur material chosen, the mould is either SLA or SLS printed and then used immediately in the injection-moulding machine. Thus, parts are ready for shipment within a few days. The material structure of the printed injection mould ensures that it can withstand the high temperatures during injection moulding, which means that one mould can produce prototypes and small batches up to 500 pieces cost-effectively and quickly. Optimum use of installation space, light weight and high stability – these are just some of the benefits of the E4.1L lean energy chain from igus. Compared to the E4.1, the application-oriented design of the E4.1 L could save so much mass that the chain is about 30% lighter; this brings an additional advantage - a considerable amount of drive power can be saved, making the application more energy efficient. 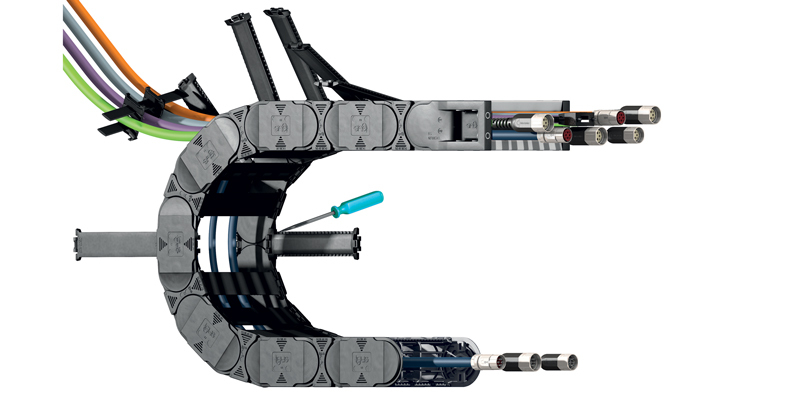 The E4.1L can also accommodate more hoses and cables in a given space envelope. The E4.1L lean energy chain is now available from stock in numerous interior heights and widths. As for the open energy chain, igus also offers an ESD version and even a high-temperature option for the enclosed energy tube to protect against hot chips and debris.